Buy lapis floral wedding collection sets from our online shopping portal swayamindia.com by placing an order online while payments can be made online as secured payments gateways are provided. Buy lapis floral wedding collection sets from our online shopping portal swayamindia.com and bring magic to your married life at nominal price. These bedroom sets are made from premium pure cotton to give you a smooth, soft texture and color consistency to make them look vibrant. 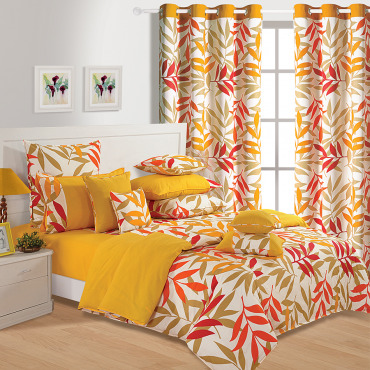 The well coordinated curtains further ameliorate your bedroom setting. See how the sunlight slowly penetrates through them and wakes you up. Everyday wake up to a new beginning as you celebrate your married life with the joy of sharing happiness with your partner. The lapis floral bedroom set have turquoise blue color straps at the sides and a white background in the centre laid with pretty rose prints. Enjoy the beauty of unique blue roses delicately printed over white grabbing your instant attention. Even the stems and leaves interlacing these tender flowers are in grey color which makes them a piece of art to mesmerize your mind. 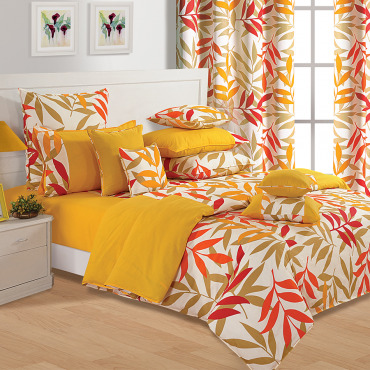 Calm your senses as you cuddle with your partner under the scented aura of the rose prints. To give your beds mushy look, two complementary pillow covers are provided to accommodate your fluffy fillers. Buy lapis floral wedding collection sets from our online shopping portal swayamindia.com and get a 100% buy back on products which are not up to your requirement. Get inside the comfort of fluffy comforters which cozying up to your partner, you can also throw in some cushions to make your slumber more exciting and pleasurable. Just as your marriage is special and the most perfect moment of your life, we want the wedding collection to be just as perfect therefore we provide customization. All you need to do is fill up a form mentioning your requirement at our website.